Red Beans N Rice Pirogue Gift Set contains (1) 1lb. Bag of New Orleans Famous Camellia Red Beans, (1) 1Lb. Bag of Zatarains Long Grain Rice, (1) 12 oz. Bottle of Chrystal Hot Sauce, (1) Read Bean n Rice Recipe Pot Holder, (1) Dat Little Cajun Cookbook by Chef Remy and a replica of a Louisiana Cajun Pirogue. 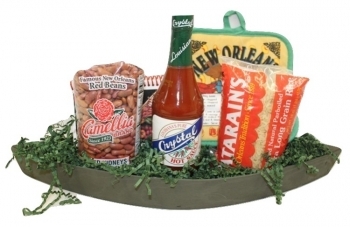 All of the products listed are floating on top of a bed of colored crinkle shred inside of the Pirogue. The entire Pirogue with it contents are celo wrapped and tied with a colorful ribbon. "Red Beans & Rice On Monday" is an old new Orleans Tradition. The wooden Pirogue makes a great decorative piece and reflects how it was used by the Cajuns to get around in the many bayou's and marsh of Louisiana.